Click here to go directly to the Doodle Poll listings below. 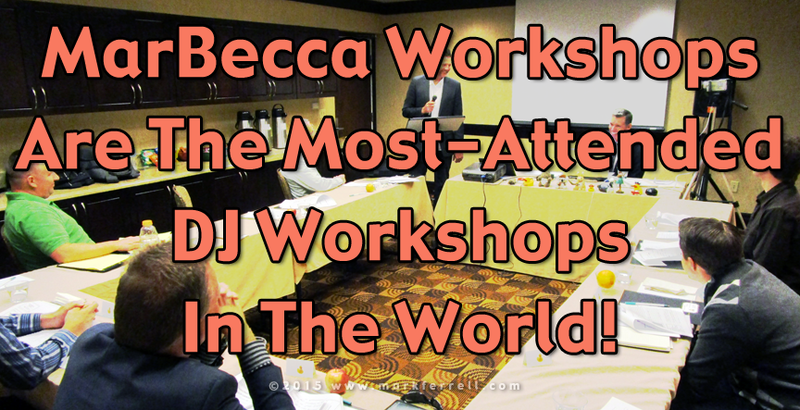 … have filled a seat in a MarBecca Method workshop since we launched in 2005!! And they are quite an international group too – DJs have traveled from Canada, Mexico, Australia, New Zealand, Ireland, and Great Britain to attend workshops soaking up everything they can to enhance their performance in some substantial way and improving their country’s DJ industry. This is such an extremely exciting time to be part of the Mobile DJ profession! It is amazing what happens when a group of 8 professionals come together to further themselves in an industry that they love and support wholeheartedly. Opportunities to attend a workshop in the U.S. in 2019 around Mobile Beat have up and ready for you to join. To gauge interest in specific cities and dates for our workshops we use something called a DOODLE POLL . . . Read on . . .
Our Doodle Poll is an awesome way to see which workshops fit into your schedule – it’s kind of like picking a college course. Your participation in the Doodle Poll is vital as the first 8 listed will be given priority to register and attend. You may add yourself as an alternate if 8 are already listed… sometimes people need to adjust their schedule and must cancel and a seat magically opens up. PLEASE NOTE: The Doodle Poll does NOT register you, but lets us know which workshops you’re most interested in. Rebecca will contact you when it’s time to plunk down some money to hold your seat at the world famous U-Shaped table. The Doodle Poll actually does not provide us with a way to contact you so Please send Rebecca an e-mail with your information. Once there are at least 5 people listed for a specific workshop it will be added to The Store. You will then be contacted so that you may reserve your seat, which requires a reservation fee. To help keep our count accurate on the Doodle Poll, please do not add your name until you are positive you can attend. If 8 are listed, please add yourself as an alternate – things do change and you may still have the opportunity to attend. Thank you!! As we add new Doodle Polls, we will keep you updated on Facebook so let’s be friends!! If you have questions let Rebecca know she’s always happy to help. Go to The Store and click on the workshop you’d like to attend. Use the drop-down menu to choose the location and date of your workshop, then click “Add To Cart”. After entering coupon code, click “Update” and confirm the adjusted amount. Then go to “Checkout” and use one of the choices for payment. ***PLEASE See our pricing pages for detailed information: Workshop Pricing Schedule. Rebecca will contact you with dates for your installment payments with the proper coupon codes, which are listed below (Coupon Codes). Your installment payments must be paid by the dates provided. If not, your seat may be given to a person on standby. Go to The Store and click on the workshop for which you’re registered to submit your installment payment using the coupon codes supplied by Rebecca (Coupon Codes), clicking “Update” after entering the coupon code. Rebecca will contact you with a final headcount at least eight (8) days prior to the scheduled workshop date. She will let you know your balance due based upon the number of people registered for the workshop and will give you the proper coupon code to use – the coupon codes are also listed below (Coupon Codes). Your final payment is due no later than 8 days before the scheduled workshop. Go to The Store and click on the workshop for which you’re registered to submit your final payment using the coupon codes supplied by Rebecca (and listed below), clicking “Update” after entering the coupon code. Keep in mind that a smaller class size might be preferable. With fewer people the cost is higher but in return you’ll get more stage and review time! That means more practice and direction. What if only 4 people register? The minimum class size is FIVE (5) seats at the regular price. However, if there are only 4 people in your group by the 8-day deadline and you would like to proceed with the workshop, you can each pay an additional premium fee to secure the workshop. If a fifth attendee joins the group within the eight days leading to the workshop, the premium fee will be refunded. Please contact Rebecca if you have three other attendees (4 total including yourself) who would like to intentionally keep the class size limited to four attendees (More time on the mic and more coaching and review). Step 5: Have a great workshop!